Our GE- 50FK High Speed Filter Sachet Packaging Line consists of High Speed Filter Sachets filling & sealing Machine and conveyor Belt with batch counting bucket option for dosing the output in zipper pouches manually. The processing sequence is as: the filter paper is drawn off from the reel, and formed to be a tube through collar-turning former and sealed, the conveyor belt conveys the sachets to the collecting & counting buckets, finally counted filter bags drops into the zipper bag holded by hand. 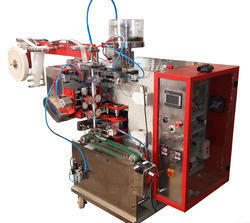 It is suitable for packing all kinds granulated product like Snus, Tea, Sugar, Coffee etc. Capacity 45 CARTONS PER MIN. To fulfill the heavy demand from the _tobacco manufacturers, recently we have developed a new model for Filter khani packing. 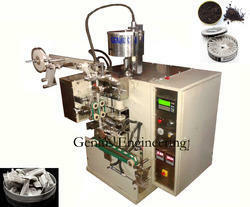 This machine can provide cheap & best solution for filter khani manufacturers. Specially designed for starters. Having Very smooth & trouble free operation. Packaging Details: Sea Worthy Wooden Pallet. Capacity 120-150 Sachets Per Minutes,120 filter portions per min.,120-150 Sachets Per Minutes,120 filter portions per min. Capacity 120- 150 filter sachets per min. Capacity 120-150 filter sachets per min. Funnel for dropping in secondary pouch: Yes.